This Friday you are invited to the opening night of the Left Coast Annual Awards Show at the Sanchez Art Center in Pacifica, featuring our own Lydia Rae Black. Lydia won the Juror's award for her work Burnside Schoolhouse 2 during the 2015 Left Coast Annual, and was awarded a Solo Show in the East Wing Gallery during this year's exhibition. Four of the works are quite recent, painted freshly this year, continuing her work on abandoned interiors and the culture of consumerism. The Sanchez Art Center is located at 1220-B Linda Mar, Pacifica, CA, 94044. Friday's reception will be from 7pm-9pm and will remain up until the 22nd of May. More info on the Sanchez Art Center here. The newest issue of local culture mag Content, "8.0 Explore", is debuting at our humble erstwhile skatium this Wednesday from 7-10. We're excited to welcome a new set of folks to see what we're working on, and Content throws a mean pick-up party. Current subscribers, new subscribers and interested individuals are invited. If you're over 21, grab a glass of wine and stroll the studios. Content Magazine released its first issue in 2012 and features local arts, culture and the people who are make our city what it is (and can be). The Alameda ArtWorks has a feature, as well as Heroes Comic Books, Black Sheep Brasserie, Cinequest and more. Pick-up parties the place to meet the people in the magazine and maybe a new friend or two. Every new issue Pick-up Party features local food and drink and performances by the Southbay's finest. This is weeknight event you don't want to miss. If you've never visited us, we're located on The Alameda near the corner of Race. Another way to put it is "behind Recycle Books". We're very lucky to have them as a neighbor, even if it proves a daily distraction from working in our studios. More info on their Facebook page. The event is free and open to the public. Make sure you see the projection installation in the back, and see the artists in the Annex and Hallway. We're happy to announce changes to our current website, so please bear with us as we endure the sometimes painful transition to a new platform. The new website will integrate with the blog, newsletter enrollment and a mobile site. Thanks to Chris Bunz for putting together a video about the Fall Open Studios and Sacred Heart Benefit! On Instagram? Follow the Artworks to see what we're doing all year long. Follow us on Facebook and Instagram for photos of every day life and more links to current exhibits form our artists. You can RSVP to the event here. 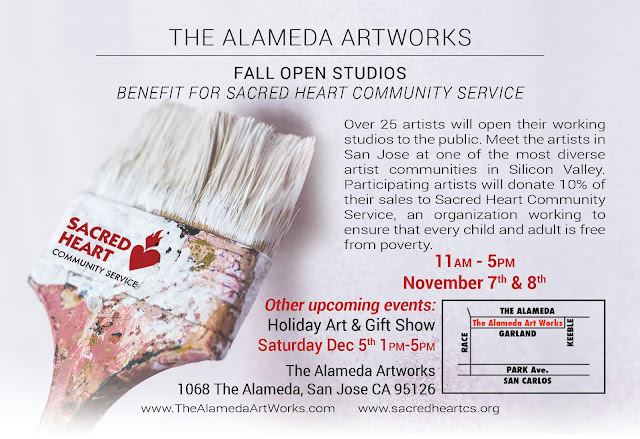 We are also a part of On the Alameda, a new #FirstSaturdays event to promote businesses on The Alameda. 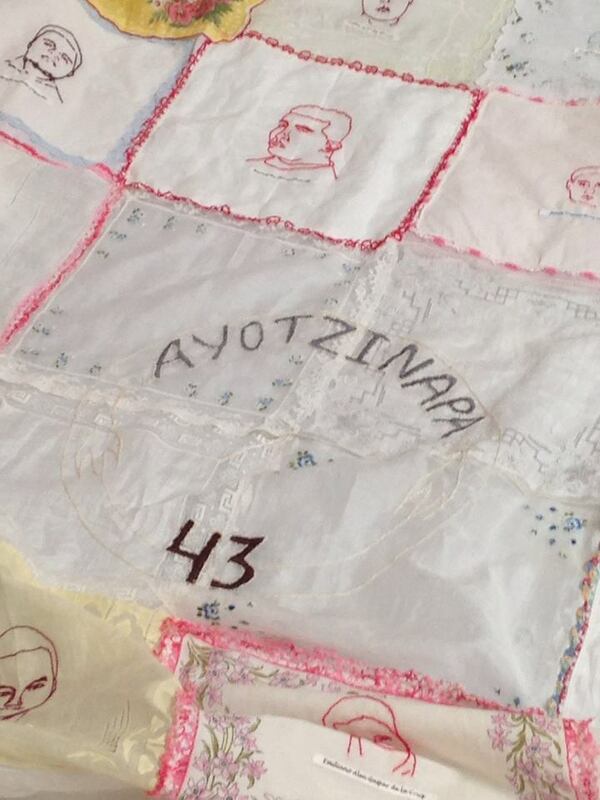 Yolanda Guerra's fiber arts piece Ayotzinapa, memorializing the mass disappearance of 43 students in Iguala, Guerrero, will be on display at the Euphrat Museum of Art at De Anza College in Cupertino. 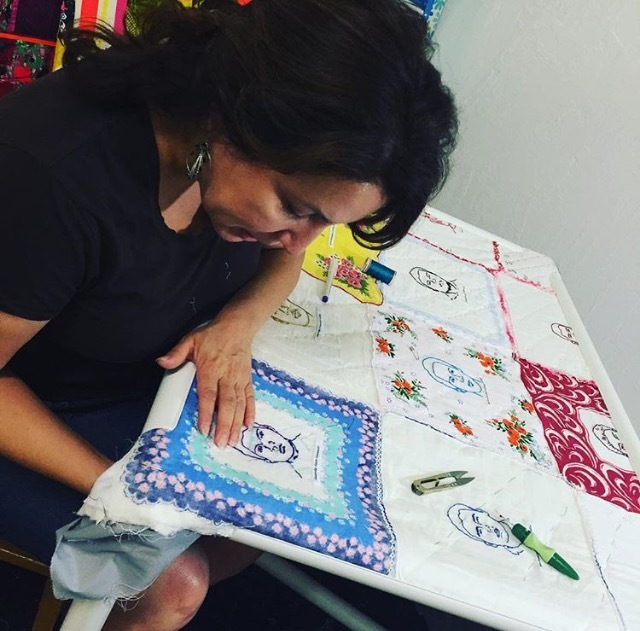 The upcoming exhibit ENDANGERED features work looking at "native languages on the brink of extinction and the evolving language of protest and participation." 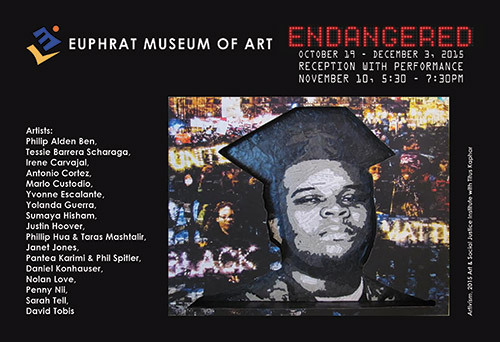 An opening reception will be held November 10th from 5:30-7:30pm with the artists in attendance. The show opens to the public October 19th and will run until December 3rd. 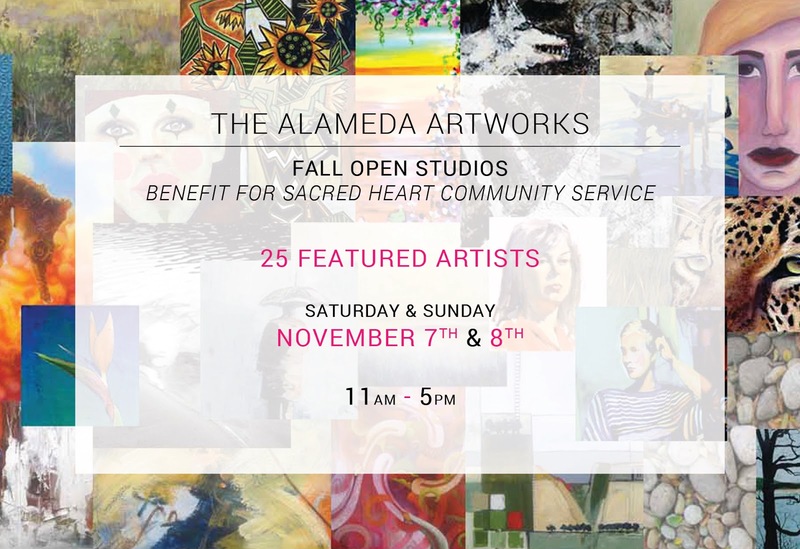 The Alameda Artworks is home to over 30 artists. Visit some of the individual artists websites or blogs by selecting their link below. First built as a Municipal Auditorium the atrium building that is now The Alameda Artworks Studios was originally the site of San Jose municipal meetings, conferences, theatrical and musical performances. Since then, it has gone through several transformations. The building is also fondly remembered by some San Jose residents as the Auditorium Roller Rink. The beautifully refinished hardwood gallery floor is the original surface on which San Jose skaters happily whirled. Most recently it was purchased by Mr. Falko Forbrich, whose patronage of San Jose artists has made it a home for artists working in many mediums.